1. 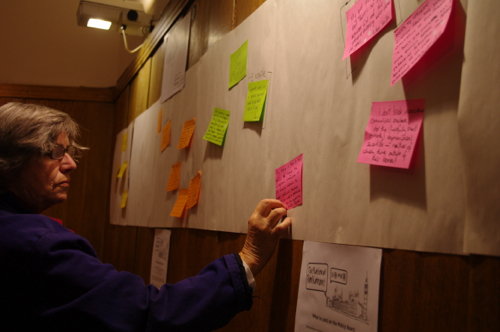 Members post feelings, issues and topics onto the Policy Board with sticky notes. 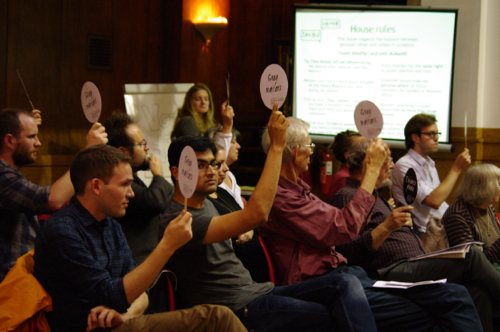 Members can mark the notes they they want to hear as part of the debate with sticky dots. 3. The Speaker opens the sitting and introduces the debate topic. 5. During 4, the Clerk and the Process Officer use the notes on the Policy Board to define four or five topics to cover during the debate. 6. The Process Officer announces the structure set out in 5. 7. Members debate following this structure. 8. The Rhetoric Officer offers comments on language use and manipulation around each topic in turn. 9. Recess for 20 minutes. During this recess, members post Late Day Motions they would like to propose in the second half of the sitting. 11. Members are invited to propose the selected motions in turn. 12. These motions are clarified through debate and with comments from the Rhetoric Officer. 14. The Process Officer asks members to rise and to stand on one side of the chamber if they are for the matter being debated, or on the other side if they are against it, or somewhere in the middle to reflect the strength of their feelings. The result is an overall ‘spectrum vote’ of Members of the Rational Parliament. are judged to sustain the quality or breadth of the debate, such as novel or provocative motions. This format has evolved since we started. You can read the format we used at our first sitting here.